1st Sign that Divorce is Near! Marriage researchers have identified four characteristics of relationships that are almost over. They are so important they have been labeled the “4 Horsemen of the Apocalypse.” Because in the Bible the 4 Horsemen of the Apocalypse appear when the end is near. The end is only near if there is no intervention like marriage counseling. Criticism has been defined as “A verbal, spoken description of a flaw in your partner’s personality.” Conversations that start with, “You Never” or “You Always” are good examples. When you criticize you are directly imply that there is something wrong with your partner’s character. Women are especially good at delivering criticisms to their partners. This is not intended to blame women. A woman will often criticize because her complaints haven’t been working, so she escalates her complaints into criticisms because she hopes she will no longer be ignored. Criticizing your partner puts them on the defensive. When someone has been criticized they no longer heard what you said. They’ve been hurt, and then they try to justify themselves. There is a negative pattern of interaction that begins once criticism has been brought into a conversation. I know you are not supposed to say, "All" or "Never," but ALL of the couples in my office for marriage counseling have this particular problem. The good news is it can be changed successfully. 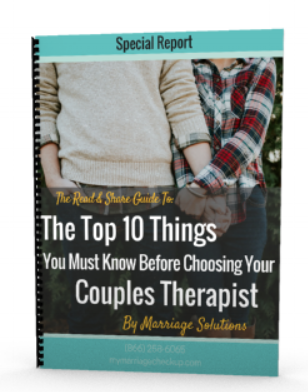 Marriage counseling can help your marriage. 2nd Sign that Divorce is Near!